The Edo State Governor, Adams Oshiomhole, on Wednesday, narrated how he escaped from the Samson Siasia Stadium, Yenagoa, venue of the 2015 governorship primary of the All Progressives Congress, after he was held hostage for hours during the exercise which was marred by violence. Oshiomhole, who spoke with journalists on Wednesday, however, accused a former governor of Bayelsa State and chieftain of the APC, Mr. Timipre Sylva, of hijacking the primary. He also dismissed media reports that the party’s primary held and that Silva emerged as the party’s candidate. The governor said the electoral process was hijacked by thugs, allegedly supervised by the former governor, who insisted the exercise should be conducted without accreditation. 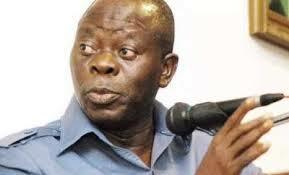 He said, “I was appointed with six other members from the APC to conduct the governorship primary in Bayelsa State. The exercise took place yesterday and, somehow, thugs took over the sports complex where the exercise was to take place. Oshiomhole wondered why the former governor insisted on his own position rather than that prescribed by the national leadership of the APC. He said, “Whereas all the aspirants agreed with the guidelines, it was only Sylva that did not. He rejected the mode of accreditation and chose to accuse the national secretariat of formulating the guidelines to frustrate his ambition. He said it became clear to him that he (Sylva) had mobilised thugs in collusion with the police, and that the thugs found their way into the stadium – without accreditation. He also accused the police of compromise as Sylva insisted that the state executive must conduct the election and not the national body. “When it became clear that our lives were under threat, I had to call Abuja to prevail on the Army and the Joint Task Force to provide me with security to enable me to leave the venue because the thugs had effectively blocked the gate under the instructions of Sylva. “The police were compromised. It was like the police were supervising criminals. Thugs opened the gate effortlessly; they came in and surrounded us. A guy was caught with several accreditation cards. I handed him over to an Assistant Inspector General of Police but the AIG released him. “Several people were apprehended with cloned cards, they were handed over to the police but were curiously released by the police and allowed them to harass and intimidate members of the committee and other aspirants,” he added. Oshiomhole said he had since forwarded the report of the event to the national secretariat of the party, adding that he believed that the party would fix a new date for a proper accreditation and fresh conduct of the primary. Efforts made to reach Sylva for his response to the allegations raised by the governor against him were not successful. His mobile phone line as of 7.15pm on Wednesday indicated that it was switched off. Also, calls to the Media Adviser to Sylva, Mr. Doifie Ola, did not connect. When contacted, spokesperson for the Bayelsa State Police Command, Mr. Asinim Butswat, said it was not true that the police colluded with thugs to scuttle the primary. Butswat said the police prevented unauthorised persons from entering the stadium venue of the exercise. “Nothing of such happened. The police provided effective security during the primary. The police ensured that people who were not authorised to be at the event were prevented from entering the venue. “Police did not collude with any thugs,” he stated. Meanwhile, the APC on Wednesday announced that it had rescheduled the Bayelsa State governorship primary following reports of irregularities and threat to peace. The National Chairman of the APC, Chief John Odigie-Oyegun, confirmed the change in date for the primary via a text message. Earlier, the Deputy National Publicity Secretary of the party, Mr. Timi Frank, told newsmen that there was no primary election in the state. According to him, one of the aspirants forced his will on the electoral committee which led to the disruption of the exercise. One of the aspirants, Timi Alaibe, had led 14 of the 19 aspirants to walk out during the primaries, citing irregularities.